Dawn of the Planet of the Apes, directed by Matt Reeves and starring Andy Serkis was an outstanding film that has all the elements that make a blockbuster. 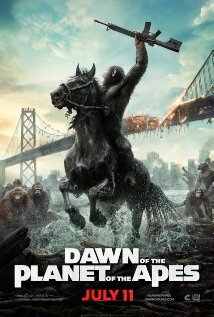 The movie takes place ten years after the Apes emerged to claim their freedom. The world is plagued with a virus that has wiped out most of the human race. Led by Ceaser and portrayed by Andy Serkis, the apes build a world where they thrive as they band together to protect their home. A group of human survivors led by Malcolm and played by Jason Clark encounter the apes in their search to bring electricity back to the city, so they can begin to restore the life they had before the virus. Caesar struggles with trust issues with the humans as Malcolm tries to convince him to come into their territory so they can restore power. Ceaser agrees but on the condition that the group of humans enter without weapons. Some of the people in the group battle with their own issues with the apes, in fear that they will be attacked. They betray the trust that is established and Caesar questions their true intentions. Koba—one of Caesar’s lieutenants, who was rescued from the Genesis research facility in the first film holds an unforgiving grudge against the humans and will stop at nothing to break the peace among the two species. Ceaser sets an example by teaching non violence, community and morels to his fellow apes, but despite his efforts to spare the lives of humans and the apes—a fight between the two is inevitable. Initiated by Koba, a war breaks out as the two groups fight for freedom. Ceaser almost meets his death as Koba betrays him in the worse way. After his home is destroyed in the forest and he is left for dead, Caesar is saved by Malcom. They seek a safe haven away from all the destruction as Caesar returns to his old home with Malcom and his family to recuperate from a gunshot wound. While on the mend, Caesar makes a connection with Malcolm and reconigizes his genuine nature as demonstrated with his past relationship with Wil Rodman, played by James Franco in the first film. Meanwhile Koba kills his kind as he makes an attempt to intimidate the other apes to follow him. The apes invade the community of humans and capture them. Koba’s intention is to inflict the same pain on the humans that he endured within the facility. The final battle between Koba and Caesar is an intense one, filled with lots of action and high energy sequences. The power and emotion behind these scenes are adrenaline driven and will leave you on the edge of your seat the entire time. In the end, power was restored within the city, Caesar killed Koba, re-claimed leadership among the apes and was reunited with his family. The 20th Century Fox film is an experience that movie goers must see to believe. The visual presentation, special effects ,score and the emotions behind the CG characters bring the story to life in way that demonstrates a creative craft that is absolutely impeccable. Even the language of the apes was impressive, the sign language blending with English and the dialect of the apes fit the tone of the film and was delivered in a manner that made you appreciate what this film represents. Andy Serkis’ portrayal of Caesar was astounding. If the Academy does not nominate Serkis for an Oscar then they really need to re-evaluate their whole nomination process. This movie grossed big at the box office and the marketing plan was strong in their efforts to draw in movie goers, so why are most films nominated that people have never even heard of, seen and or released in a limited capacity? I’m looking forward to Andy being acknowledged in the Oscar Realm. He deserves it. Dawn of the Planet of Apes has become an instant modern classic and was masterpiece in every way shape and form that a film can be. A must see on your summer movie list. I gave this movie 5 Stars! !